MetaboUP Plus Review: Can This Actually Increase Metabolism? 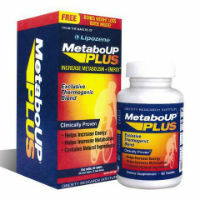 MetaboUP Plus is an “exclusive thermogenic blend” that comes from the Obesity Research Institute. An energy enhancing supplement, this non-prescription diet pill boosts metabolism and assists with weight loss by helping to speed up the body’s calorie burn. Supposedly it helps to facilitate weight loss by promoting thermogensis. This is a metabolic process, which causes the body to burn calories to generate heat. Theremogenesis is induced by diet, exercise and environmental temperature. The belief is that it can benefit weight loss because it gives the body’s calorie burn a boost. The ingredients in MetaboUP Plus contain no calories, no sugar, no artificial stimulants, essential B vitamins and amino acids as well as “clinically prove ingredients for weight loss.” The formula is composed of: Green Tea Extract, Gurana Seed Extract, Caffeine, Oolong Tea Leaf, Kola Nut Extract, Cayenne Fruit, Vitamin B6, Vitamin B 12, and Platycodon Grandiflorum Root Extract. For starters, absolutely none of these ingredients are clinically proven for weight loss. Although they are commonly found in many OTC weight loss products on the market, there has never been any solid scientific proof that can support this clinically proven claim. The only ingredient listed above that has been found to boost energy and increase fat burning is caffeine. That said, just because it can increase fat burning when taken in conjunction with physical activity, this does not mean that the fat that is lost will lead to weight loss. Secondly, this product contains multiple stimulants including caffeine and three ingredients containing caffeine (green tea, guarana and kola nut). This much caffeine is quite the assault on the central nervous system and even individuals who do not have caffeine sensitivities may be at a risk of experience certain unpleasant side effects, such as jitters, sleeplessness, restlessness, anxiety, fast heartbeat, headaches and upset stomach. Thirdly, while an official website existed for MetaboUP Plus, which contained detailed information about each ingredient and other facts about the product – at the time that this review was written – there was no supplement facts sheet available on the site. Therefore, even though all the formula’s ingredients were revealed, it is unknown how much of each ingredient there is in each serving. While this is a concern, what makes it an even bigger red flag is that there’s no telling how much caffeine is in the product. Although on the official site the claim is that it contains “slightly more caffeine than a cup of coffee,” this statement is completely meaningless since there are no numbers to which to compare it. Considering the number of caffeinated ingredients, it seems hard to believe that it contains only slightly more than a cup of coffee. You should speak with your healthcare provider before taking MetaboUP Plus. This entry was posted in Non-Prescription Diet Pills Reviews and tagged caffeine, Cayenne Fruit, green tea extract, Gurana Seed Extract, kola nut extract, Oolong Tea Leaf, Platycodon Grandiflorum Root Extract, Vitamin B 12, Vitamin B6 on August 17, 2016 by Diet-Pills.cc.